Semiprecious stones and rocks can be found in most geographical areas around the planet. The ability to spot them in their rough form or as part of larger rocks develops with research and time. The more you know about each gemstone's natural environment, as well as the color and shape variations the stone most likely possesses, the easier it will be for you to spot one in nature. Determine which types of semiprecious gemstones and minerals are found in the area you'd like to search. Visit the library to read about your state's geography, or search for rock-collecting and gem-hunting groups online that discuss your region. Search also for lapidary clubs online. Join those near you, if desired. Search for images of the raw, uncut semiprecious gemstones pertinent to your area -- jade, for instance -- and familiarize yourself with their shapes and colors. Find as many image samples as possible and note the differences. 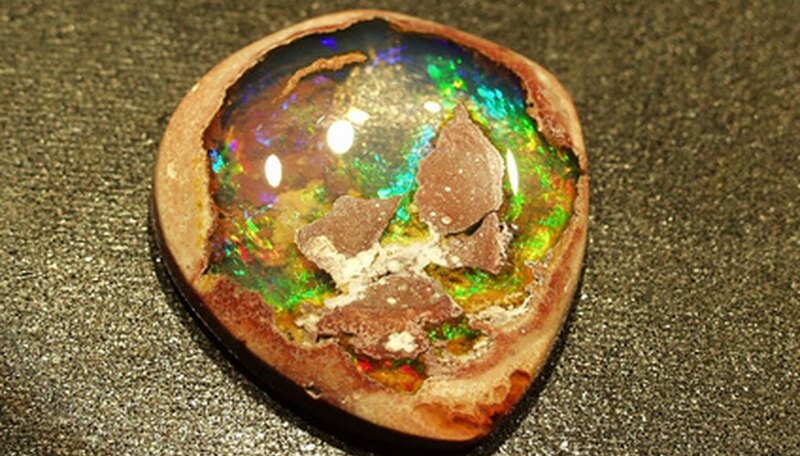 Visit local lapidary clubs or shops, if possible, to view their collections. Ask those knowledgeable to show multiple uncut examples and to show you similar stones so you can learn the differences between them. If they are willing, ask them to quiz you until you are good at identifying raw semiprecious stones found in your region. Find a place to go rock hunting; some states have businesses where you can pay to search for and keep the gemstones you find. Otherwise, ask rock collectors or search rock-collecting forums to determine areas that are good to search legally. Dress according to the area that you will search -- wear waders for river searching, for instance, or hiking boots if climbing in rocky or wooded areas. Work gloves are useful as well. Carry assorted useful tools for the trip: a geologist's hammer or a pick, a sturdy brush, a shovel and a bag or backpack for collected items. Brush off any potential gemstones you find and look at them closely. Use a magnifying glass if necessary. If the stone is part of a larger rock sample, chip away at it a bit to get it down to a portable size. Keep any stones that may be of interest. If unsure of a stone's value or type, you could always ask someone more knowledgeable later on. Joining lapidary clubs will open the doors for more rock-hunting and gem-working opportunities, as well as special events you may otherwise not know about. Be sure it is legal to search for and keep rocks from areas you search. Always get permission before searching private property. Never go on a rock-hunting search alone. The buddy system is always the best and safest choice. Where Can I Mine for Gems in Utah?